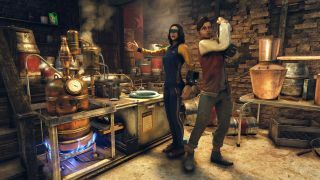 The roadmap for Fallout 76's updates included a "brewing and distilling" update for March 12 and on Bethesda's Inside the Vault blog there's a preview of what we can expect from it. It begins with a quest called Wasted On Nukashine handed out by a new character called Biv ("Appalachia’s tipsiest robot"), and which involves crafting a new variety of workbench called the Brewing Station as well as the Fermenter. There players will be able to concoct our own alcoholic beverages with various buffs, and associated hangover debuffs. For example, Hoppy Hunter beer improves scope stability but also reduces VATS accuracy. Some drinks can be improved via fermentation, adding "vintage effects"—firecracker whiskey normally sets you and your enemies on fire, but if it's aged your attacks will only burn enemies. To learn the recipes for new drinks players will have to do Biv's repeatable daily quests. The subsequent update on March 19 will add a new event called the "Fasnacht Parade".